Wear your art! That’s what we say for our amazing Sew Up Vests! 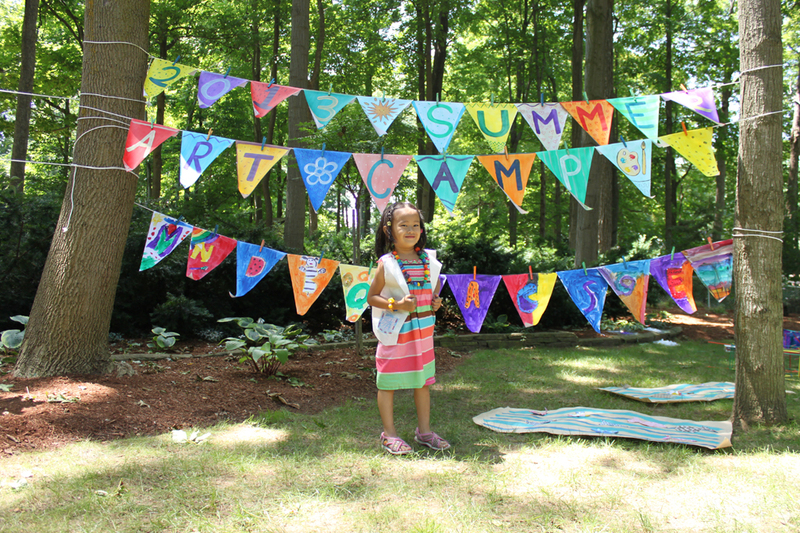 These multi-skill craft projects are made from versatile Color Diffusing material so that the paint design you make on the vest creates a tie-dye like effect when you add a bit of water. 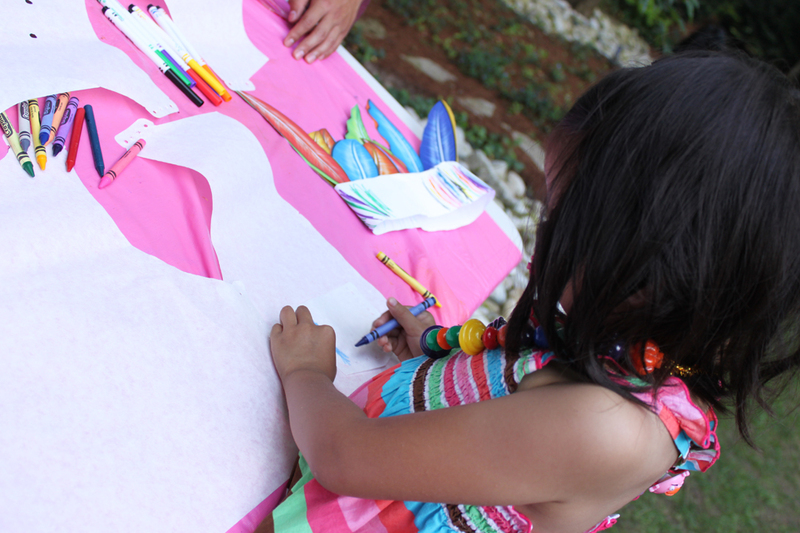 Paint, fold, sew and wear your vest for a variety of classroom activities! 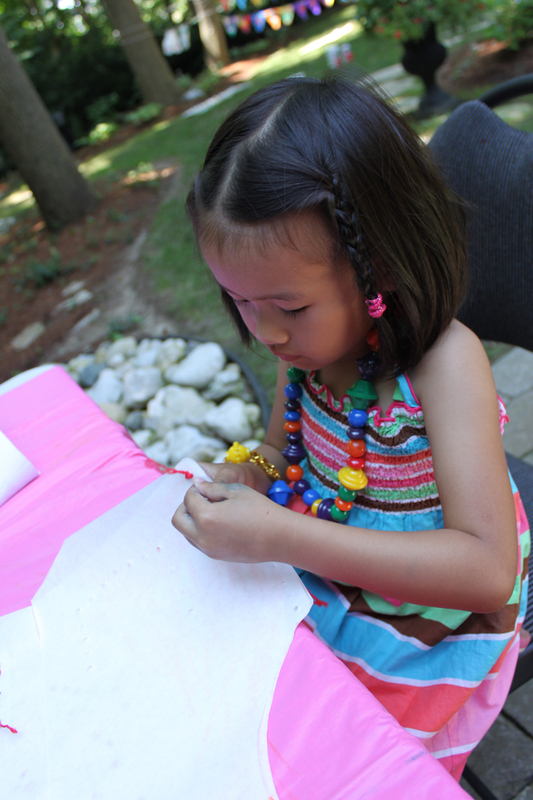 Sew Up Vests help encourage fine motor development while giving children the creative freedom to design their own wearable vest. The vests dry fairly quickly in the sun after painting, so you don’t have to be stuck waiting for long! To see more about our Sew Up Vests, visit this webpage. The accompanying teacher’s guide gives you more project ideas and suggestions to experiment with your Sew Up Vests. Use the vests for group differentiation, gross motor exercise, math and literacy games, or for drama class! 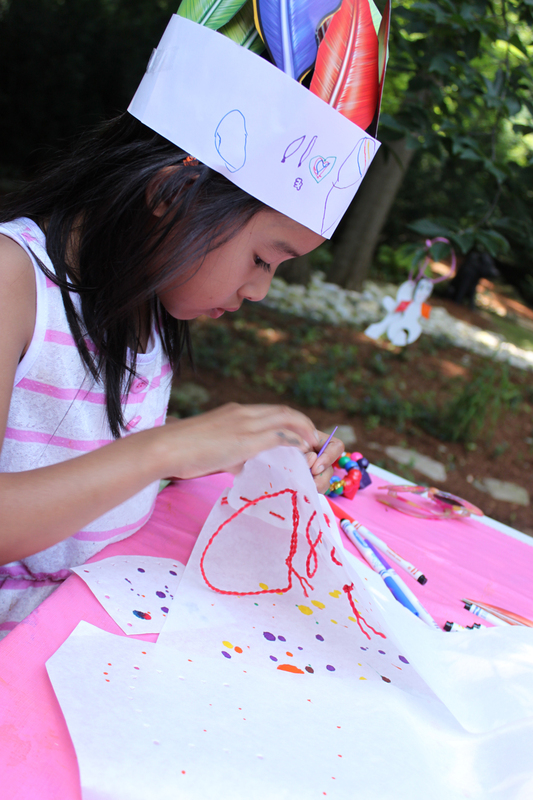 At the Art Camp, our little artists went to town with their vest designs! We supplied the campers with markers and spray bottles of water to help distribute the ink throughout the vests. Some of our campers decided to use crayons instead! 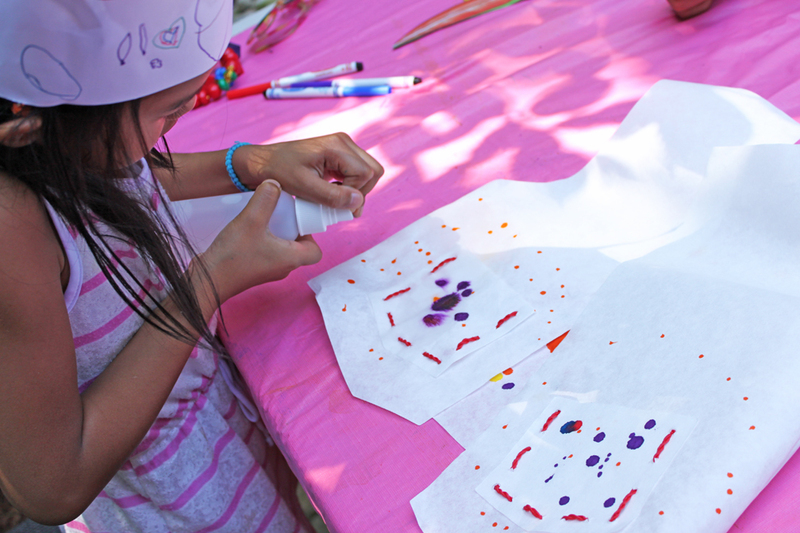 Once several spots of marker were applied to the vest, the campers used their spray bottles to spread the ink throughout the material. Next, we sewed the various pieces together. There are two pocket pieces, a back vest piece and two side vest pieces. All the pieces have matching holes to help coordinate your students’ sewing. Here, we use our plastic sewing needles, which are included in the kit. The guide provides you with further details on how to sew together the vest. We tried a few spots with paint first to see how they turned out! The best part was getting to wear the vests. These art vests are perfect for students to personalize and to feel good about wearing them. Thanks for viewing this post! Subscribe to this blog today to get updates on new craft products and craft ideas every Monday, Wednesday and Friday! Send us any comments, questions or suggestions through the contact form at the top of the page. 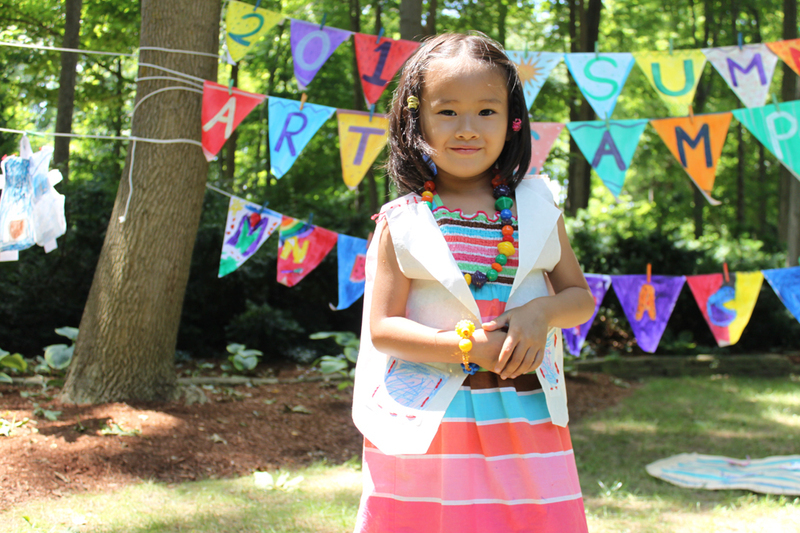 This entry was posted in Art, Crafts and tagged activity, art, color diffusing paper, crafts, kids, markers, outdoor, school, sew up vests, sewing, watercolor, wearable art by roylcoblog. Bookmark the permalink. I love these! It’s nice to see a wearable that’s not a t-shirt. So fun! So true! 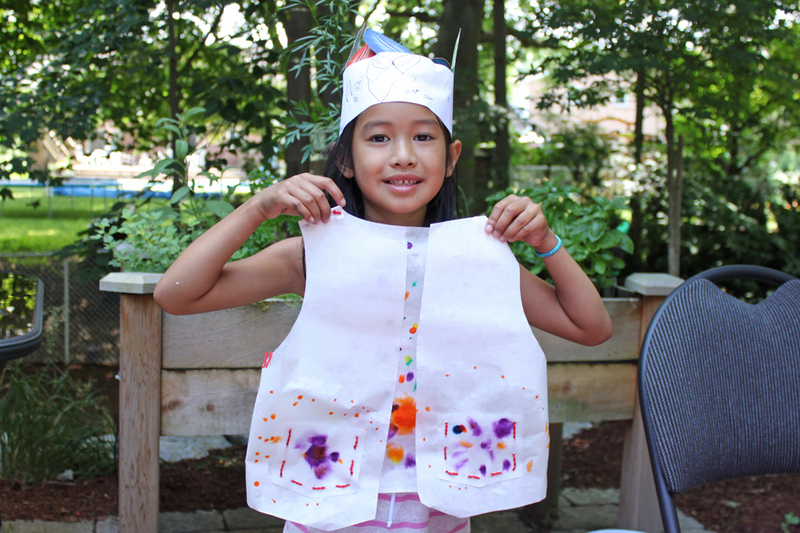 At the Art Camp, we helped one artist attach a button to one side of the vest and a loop of string on the other so the vest could be buttoned up! It’s a great project to wear over top of existing clothes or use as a smock for other art projects.